Confidence among Wellington region businesses has retreated to pre-Christmas levels, according to the latest Wellington Chamber of Commerce Business Confidence Survey. The survey, conducted over a two-week period in June, showed that confidence in the local and national economy, businesses’ own situations, and earnings forecasts have all fallen since the previous survey, in March. Confidence is also significantly lower than at the same time last year, while confidence in the national economy is negative for only the second time since 2009. The survey shows that a net 18 per cent of respondents expect the Wellington economy to improve over the next 12 months – compared to the net positive 21 per cent in March. In June last year, a net 55 per cent responded positively to the same question. 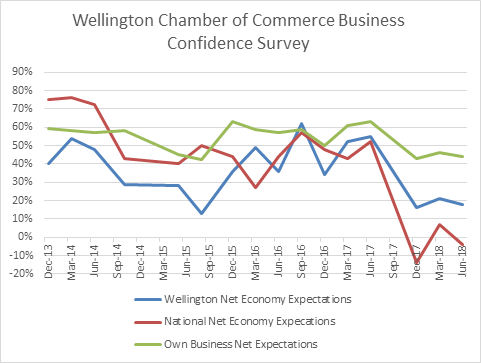 Wellington business confidence in the national economy has fallen to a net negative response after returning to net positive in the March quarter. A net negative 4 per cent now expect improvement, down from a net positive 7 per cent per cent. This is only the second time net sentiment in the economy has been negative since January 2009. The previous time was in December last year. Businesses’ confidence in their own situation continues to drop, with a net positive 44 per cent expecting an improvement over the next 12 months, compared to 46 per cent in March. In June last year it was 63 per cent. A net 41 per cent of respondents expect their earnings to improve over the next 12 months, compared to 44 per cent in March. In June last year this was a net positive 61 per cent. Of all respondents, 56 per cent expect earnings to improve, while 14 per cent expect them to decline. The number of businesses expecting to invest more in plant and equipment over the next 12 months has dropped for the third quarter in a row – from 23 per cent net positive to 20 per cent net positive. However, intentions to hire staff have increased. When asked what changes they expect to staff numbers over the next three months, a net 25 per cent of businesses said they expect to be looking for more staff. Finding skilled staff continues to be a challenge for most businesses, with just 4 per cent saying it’s easier to find skilled staff now than it was 12 months ago. This is consistent with the previous two surveys. Some 47 per cent say it’s harder to find skilled staff, up from 41 per cent of respondents in March. When asked unprompted what barriers are holding back their business, the No 1 issue was an inability to access or attract skilled staff (21 per cent). This is consistent with the Chamber’s surveys over the past year. When asked unprompted what barriers or issues they believe are holding back the Wellington economy, the most commonly cited issue was infrastructure, including roads, airport runway, rail system, and internet connection speed (31 per cent of respondents). This was followed by local and central government leadership, direction, and policy (19 per cent and 13 per cent respectively). Chamber of Commerce Chief Executive John Milford said he believed the results showed business was concerned that recent moves by the Government would have a detrimental effect on their ability to grow. “A lot of this has to do with changes to workplace legislation as contained in the Employment Relations Amendment Bill – such as the proposal to remove 90-day trial periods from companies with more than 20 employees, allow union reps to enter a workplace without permission, force businesses to settle collective agreements, and force them to join a multi-employer collective agreement. “Businesses are telling us that these proposals will further reduce their flexibility and harm their growth prospects. “It also has to do with increases in the minimum wage policy and managing increases in wages and wage expectations. Even the increase in the number of strikes is having an effect. Though they don’t involve business directly, they’re adding to the general climate of uncertainty that business is facing right now. “If they’re telling us they’re not confident to invest – be it in new skills or new plant and machinery – it’s because they’re not happy with what they’re seeing. “Business perceptions are driven by market conditions, and by local and national government actions, and that’s why confidence is low. Eds note – Net percentage is the balance of sentiment, positive minus negative responses.